A uniquely modified design for 3 and 5 way drafts is still attracting strong sales nearly a decade after being introduced to the market by Quality Steel Fabrications and Engineering . Designed and fabricated on site at the Quality Steel Fabrication & Engineering Richmond and Townsville plants, the 3 and 5 way drafts feature a unique 2-in-1 triangle baulk gate with a front head bail that automatically puts a beast's head in lock for checking or treatments. Manager of Quality Steel Fabrications and Engineering Richmond, Matt Hudspith, says the designs protect the operator by not bringing them into contact with the beast. 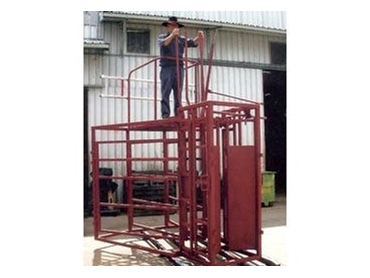 “The 3 and 5 way drafts make it simple to draft or separate your herd such as calves, cows, bulls and camels and can be controlled from the safety of an easily-accessible platform on the top of the frame or a platform on the ground up to 6 metres away,” he says. These drafts have been been bought by ringers, camel herders, stockman, cowboys and cattlemen from Queensland, Northern Territory and New South Wales. While Quality Steel Fabrications and Engineering's drafts are unique from all other products on the market, they can also fabricate custom-designed drafts to meet the requirements of clients, within a quick turnaround period of two to three weeks. Cigweld equipment and services such as general steel fabrication welding repairs.